No matter if you intend to run an e-commerce storefront or a company website, the CMS you choose will determine your brand’s online future. Drupal and WordPress are only the tips of the iceberg when it comes to popular CMS choices. However, they are most commonly associated with quality, support and accessibility both on admin and user side of the equation. According to statistics, WordPress powers 26% of the entire internet. Although the number may seem low at first, Drupal manages to garner 3.6% of the internet. Even though they are closely tied. But in terms of features and general functionality, one still reigns over the other. But that is in terms of versatility and depth of services on offer. One major benefit of properly choosing your CMS is the ability to customize it completely from the dashboard. Web designers and developers often have to juggle several platforms and software apps in order to make changes such as these function properly. A good CMS will allow you to control and modify your website from multiple accounts and workstations. This is great in terms of versatility, especially for large e-commerce sites with decentralized content management. Nothing is stopping you from adding a plugin or two to your CMS – if the system itself supports that level of modification. 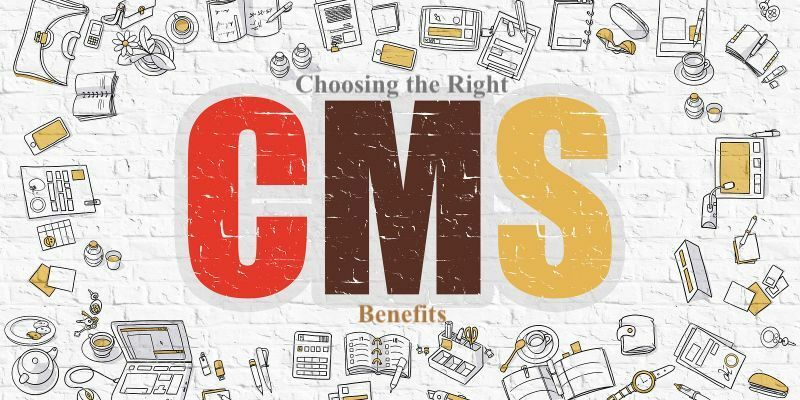 The right CMS will allow you to quickly and easily transform your site from a blog to an online store, to an advertisement platform within several easy clicks. Lastly, a good CMS is the one that doesn’t require any coding knowledge to work properly. Anyone from content creators and designers to the managerial staff and administration should be able to manage the CMS easily. Now that we have a basic understanding of how a CMS can affect your everyday website management, let’s dive into the gritty details. The one point of content many people have with online content management is how it often lacks accessibility. This is because web designers often opt for the CMS which works for them personally, rather than asking content creators and managers on what to do. Drupal is a much more old school choice of CMS in the way in which content is managed. Even though it has more potential for development and features, it is generally considered to be harder to manage and subsequently recommend to anyone without coding skills. With WordPress, it’s much easier to manage your content in an accessible, user-friendly manner. It’s only natural that you would want to differentiate your website from others on the web. In that vein, Drupal won’t help you be distinct and memorable to the visitor. This is because Drupal operates on a system of modules instead of plugins which are a norm for WordPress. These are limited in their choice and offering, meaning that there are only so many combinations to choose from. With WordPress, only the sky is the limit in terms of choosing the theme for your website. With dozens upon dozens of free and premium WordPress themes out there, you will be hard pressed to choose the right one for your own website. Since we have touched on the topic of plugins and modules, it’s worth noting that WordPress excels in that area. Platforms such as Google AdWords and SEM Rush offer their rudimentary plugins which can be added to WordPress for extra Search Engine Optimization (SEO). In adding them, you will be able to optimize your site for better ranking and receive more traffic and conversions. WordPress also offers translation plugins to be added to the CMS, enabling website localization possibilities as a result. It’s also worth noting that WordPress is available in 50 languages and the selection is growing with each version. 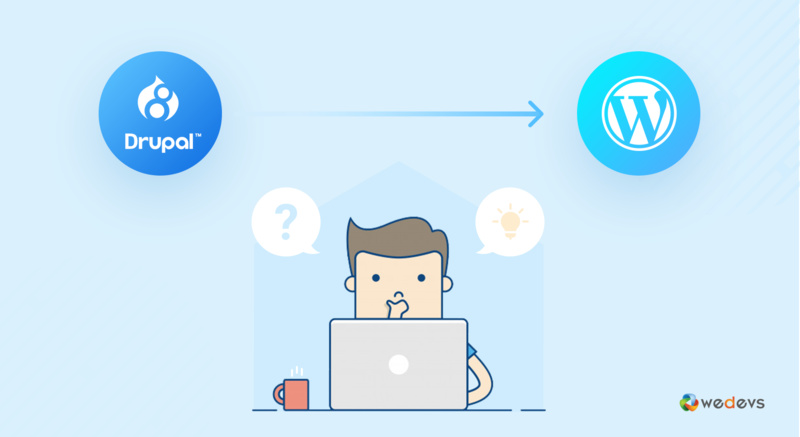 In terms of Drupal and its modules, SEO is an afterthought and you will have to do most of your optimization by hand or by outsourcing your content to professional writers. As you can see, it’s difficult to talk about CMS systems without delving into their plugins (or modules in case of Drupal). The selling point for most administrators and web designers is the sheer volume of plugins available for WordPress CMS. Both official and third-party extensions are available across the web and official WordPress channels. These extensions serve to add, subtract or otherwise modify the core code and functionality of the CMS. This means that you can practically transform your website into anything you imagine it to be. However, this is often not the case with Drupal and its limited selection of modules. While it is potentially more powerful and versatile, it’s quite difficult to monetize on the fact without programming skills under your belt. WordPress is free to start off with, with numerous hosting and customization options coming in added expenditures. However, what makes this CMS perfect for beginners, individual content creators and small firms is the low cost attached to it. You don’t have to invest into a single plugin or premium theme if you choose to do so. While your site won’t be as mesmerizing as it could be in terms of visual fidelity or functionality, you will have a cost-effective online presence on your hands. Drupal, on the other hand, is a different beast entirely. Developing a fully functional, feature-rich website will sometimes run you upwards of $3000 which is quite bloated in comparison to WordPress. More than anything else, WordPress is alive and well, despite its age and numerous iterations. The development team behind the giant CMS still finds new ways to surprise their audience. This is done with features and benefits worth checking out. This is what separates WordPress from Drupal, Joomla and so many other CMS solutions out there. No matter where you look, you are bound to find a forum or a discussion in regards to WordPress issues, tips, tricks and upcoming development updates. Drupal is more robust and straightforward in that regard. While you will find your fair share of tutorials and helpful tips around the web, they are overshadowed by a general lack of public interest in comparison to WordPress. 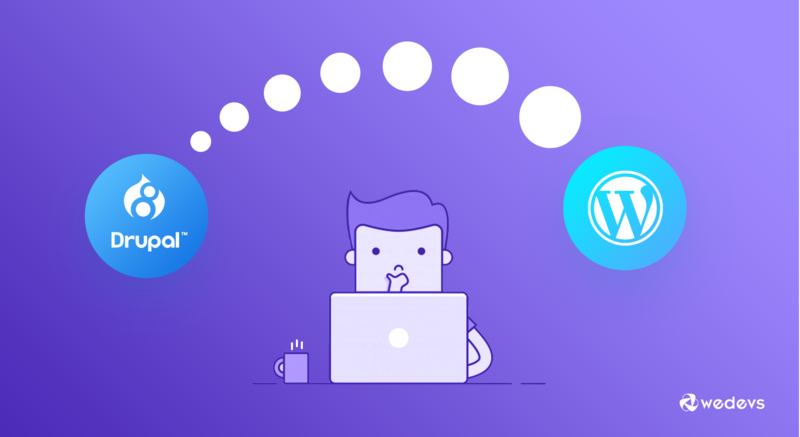 This is what makes WordPress a more user-friendly experience in the long run, even though Drupal might offer more in terms of ground-up web development. 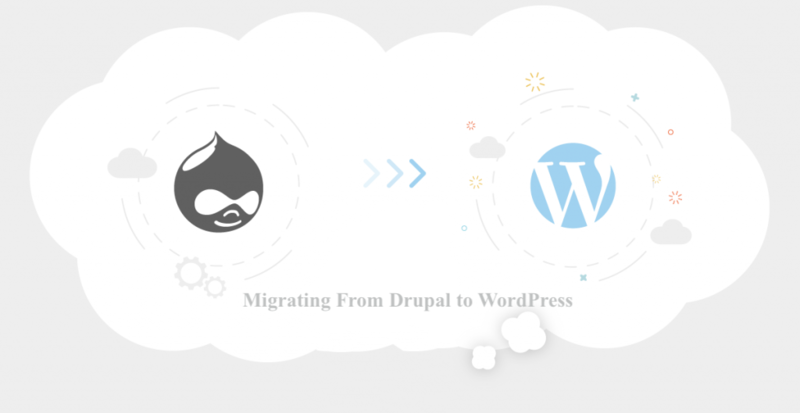 Migrating from one CMS to another is a hassle, but a necessary one at that. WordPress is the way to go if you plan on maintaining your website in a team environment and keep adding to it over time. Drupal, on the other hand, is leaned towards coders. And people who want full control over their site’s development from the early steps. While this may sound like a viable scenario, do keep in mind that you won’t be able to utilize Drupal fully without a dedicated web designer on your team. For that reason alone, WordPress is worth looking into as your migration solution. arrow-point-to-right Created with Sketch. Group 19 Created with Sketch. Group 14 Created with Sketch. Group 7 Created with Sketch. Group 13 Created with Sketch. Shape 2 Created with Sketch. Group 11 Created with Sketch. Group 12 Created with Sketch. Group 8 Created with Sketch. sharing-interface Created with Sketch. Group Created with Sketch. Group 6 Created with Sketch. Group 15 Created with Sketch. Group 3 Created with Sketch. weDevs Editorial Staff prepares and cooks all the content that are published on weDevs.com. They are responsible for all type of web content including blog, social posts, videos, documentation etc.